Don’t miss these local delicacies! “Blessed with an abundance of seafood, tropical fruits, and creative cooks, there’s more to Filipino food than the mind-boggling balut (duck embryo)” ”CNN Travel”. Antony Bourdain called sisig a “divine mosaic of pig parts.” He also said that lechon was the best whole roasted pig dish he ever had. 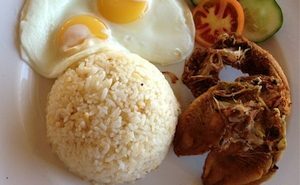 Filipino food is gaining popularity these days and recently the Philippines has become one of the top ten countries with the best food. There is no better way to get a taste of the Filipino delicacies when taking a vacation in Palawan. You can try out the many dishes by eating either from the street vendors or restaurants. The style of cooking and the food associated with Philippine cuisine have evolved over many centuries from its Austronesian origins to a mixed cuisine of Spanish, Chinese, Malay, and American. 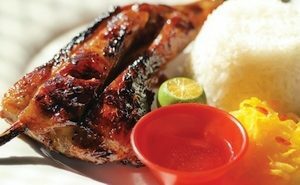 Chicken Inasal is a delicious grilled chicken dish. The chicken is marinated in a unique blend of spices and herbs, then grilled until done. Several restaurants in Palawan island serve this special grilled chicken dish and they are all very good. We suggest trying it at Haim Chicken Inato Restaurant in Manalo Extension. Literally translated, it means “Mix-Mix” in Filipino. Halo Halo is a popular refreshing drink which consists of a mixture of sweetened preserved fruits, evaporated milk and crushed ice. 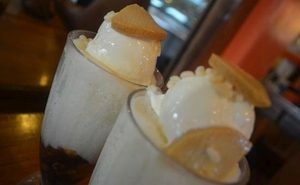 The topping is either ice cream or leche flan.The best place to try Halo Halo in Puerto Princesa is Noki Nocs Savory House on Rizal Avenue. 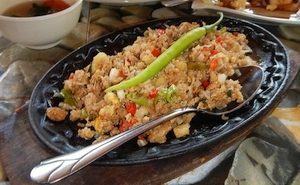 Another exotic dish you can try in Palawan is Crocodile Sisig, a variation of the sizzling dish that typically uses pork. The taste of crocodile meat is similar to chicken, mild flavoured and firm in texture. It’s a healthy meat due to its high protein and low-fat composition. Some of the Filipino dishes that can be made from crocodile meat are sisig, Bicol express, sausages, and tapa. Sisig, which means “to snack on something sour” it refers to a method of preparing fish and meat marinated in a sour liquid such as calamansi juice or vinegar, then seasoned with salt, pepper, and other spices. You can try Crocodile Sisig at the Ka Inato Restaurant on Rizal Avenue. 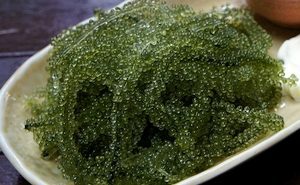 Lato seaweed, also known as or sea grapes or green caviar is a very popular dish in Palawan due to its soft and succulent texture. It is best served with either salt or vinegar and is a perfect match to any dish especially fried ones. Lato seaweed is very common to the Philippines and nearby countries, however, the best quality comes from the municipality of Cuyo in Palawan. If you are going to Coron, make sure to try the popular dish danggit lamayo. It consists in sun-dried Rabbitfishes marinated in vinegar, garlic, and pepper. Danggit Lamayo is served for breakfast in most of the hotels and guesthouses. 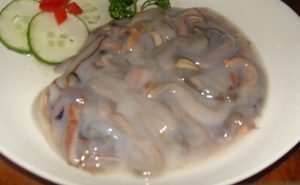 Chao Long noodles have been introduced to Palawan by the Vietnamese immigrants. Puerto Princesa’s Chao long is flat, thin rice noodles in a sweet-savory broth with meat (beef or pork), served with the requisite plate containing sprigs of mint and basil, raw bean sprouts and calamansi. 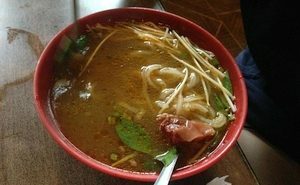 You can try Chao Long noodles and other Vietnamese dishes at the Rene’s Saigon Restaurant on Rizal Avenue. Sampling exotic food in Palawan will most definitely broaden your culinary horizon and expand the way you think about food. One of the most popular dishes is the Tamilok. Tamilok known as woodworm, it’s actually a mollusk harvested from mangrove trees. It has a very long, soft and flabby body which tastes like an oyster. Many restaurants in Puerto Princesa serve Tamilok, though the most famous is the Kinabuch Grill & Bar on Rizal Avenue. Palawan seafood is a wonderful product. There is a large variety of fresh and tasty seafood which is easily accessible and affordable. 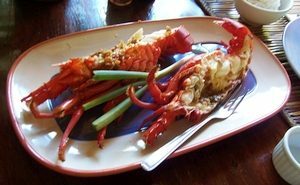 Badjao Seafood and KaLui are the best seafood restaurants in Puerto Princesa. They offer a wide variety of dishes which depends on the fresh catch of the day. The menu includes Tuna, Shrimps, Blue Marlin, Crab, Lobster, Seabass and squids. Lechon manok (chicken) and liempo (pork belly) is a Filipino term which means roasted meat. 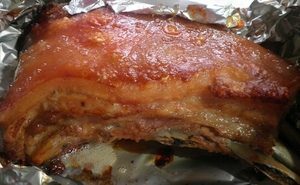 Lechon is also a whole roasted pig with golden brown crispy skin. This can found at the street food stalls for the cheapest price. The lechon usually come with a sweet and spicy sauce made from liver. Hopia is a popular Filipino bean filled pastry originally introduced by Fujianese immigrants in urban centres of the Philippines. It is a widely-available inexpensive treat and a favoured gift for friends and relatives. 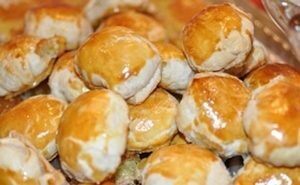 There are two types, the flaky type which uses Chinese puff pastry and the cake dough type which uses a soft cookie dough. Baker’s Hill sells delicious home-made bread and baked goodies. The most popular item on sale is the hopia bread. Some of the traditional cashew delicacies can be found in Coron. 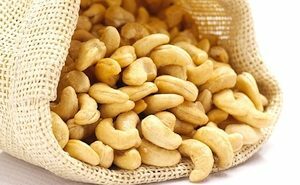 Aside from the classically roasted cashew, you can try the delicious variants such as Bandi and Brittle, cashew nuts flawlessly coated with smooth, honey and caramelized brown sugar. Coron Harvest shop is the best place to buy quality cashews.